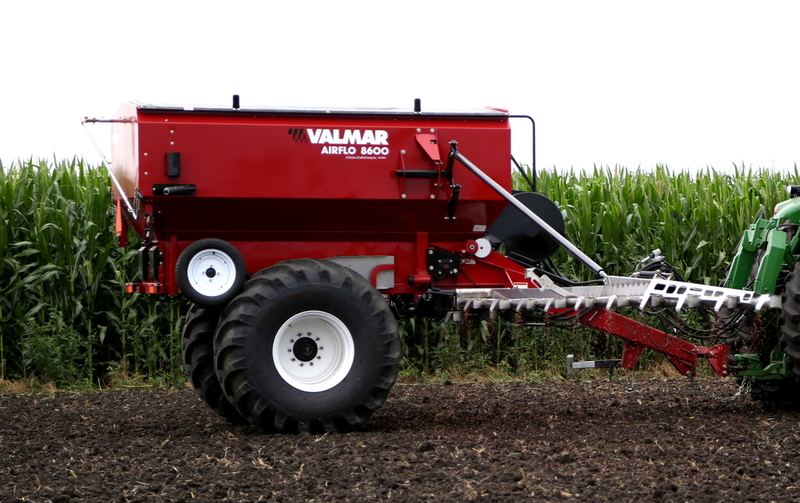 Salford's Valmar 8600 is a high capacity, high speed, air boom applicator capable of delivering up to 1000 lbs/acre at 8 mph. The highly accurate Venturi metering system is simple to calibrate and easy to operate allowing anyone to take to the field with the 8600. Are you interested in a quote or demonstration of the 8600? Please fill out the form below and one of our Territory Managers will be in touch shortly. Salford's Valmar 8600 is a high capacity, high speed, air boom applicator capable of delivering up to 1000 lbs/acre at 8 mph. The highly accurate Venturi metering system is simple to calibrate and easy to operate allowing anyone to take to the field with the 8600. An optional secondary hopper compartment and secondary metering allows for the application of lower rate herbicides and micronutrients alongside your granular fertilizer. The 8600 has left / right section control that can be operated manually or automatically with prescription maps when equipped with hydraulic variable rate metering and ISOBUS controller. - Single motor drive hydraulic metering kit with electric clutches for left hand/right hand on/off.